This is Xen-Tan's Magic Tan, yup, Magic Tan! Apply the clear gel and leave to develop for 3 hours to reveal a luscious deep golden tan. The skin will also appear dewy thanks to the gentle iridescent sparkles. The say this is there quickest drying, longest lasting tan. Let me put this all to the test! 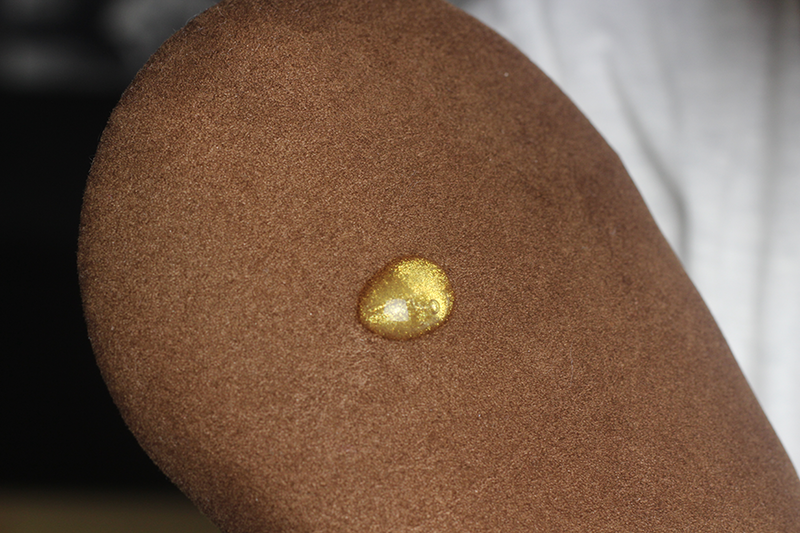 A tan with a difference for me, a clear gel that has loads of gold shimmer inside. Paraben-free, so for all those who dislike parabens, thou shall not fear! Water (Aqua), Glycerin, Hydroxyethyl Acrylate/Sodium Acryloyldimethyl Taurate Copolymer, Tocopheryl Acetate, Sodium Hyaluonate, Dihydroxyacetone, Fragrance, PEG-40 Castor Oil, SD Alcohol 40, Mica Titanium Dioxide, Ircon Oxides, Trimethylpentanediol/Adipic Acid. I used their mitt and a plastic glove under the mitt. They do say you can use just your hands and once finished wash your hands with warm water and soap for 1-2 minutes. As it goes on clear there's not much indication where your applying it, besides the odd flecks of gold shimmer sweeping over the legs. It's easy to blend over the legs, I prefer gel to mousse application to be honest but I did feel that sticky feeling a little when it started to dry, reminded me of gel on the face. They suggest still wear dark clothing while tanning & wait 3 hours before any water contact. The smell, I LOVE THE SMELL! Yup, I love it, when I first squeezed it out I was expecting that typical stench. There's a sweet scent to it, even during application. I can't say that once it was drying I smelt anything, blame the oil burner and candles around me. 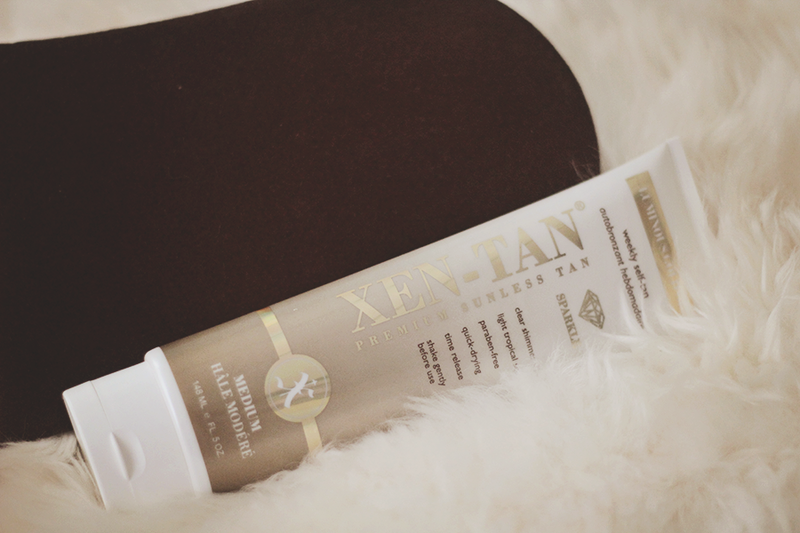 Xen-Tan call it a tropical smell, smelling it again reminds me of the Hawaiian Tropic Aftersun! It says within 3 hours you will develop a dark complexion, I took ill after this application and just had to get into bed but I did get up and notice my legs were a little darker but the next day as you can see in the after picture there was a deeper colour. The knee caps were a little red but once you shower/bath and rub those legs clean, I was left with a nice more healthier brown glow to my legs. This tan lasted me about 5 days with regular exfoliating, started to fade nicely for me. With the smell being welcoming and the fact that it develops quick, giving you a chance to apply and still shower before a night out it's convenient for those wanting a quick tan for the night. As I said I prefer this gel to mousse it's less messy. I've currently got my beady eyes on their Xen-Tan Moroccan Tan! Are you a fake tanista? Have you tried this award winning tan gel? Gel based fake tan? Intrigued! I've never thought about getting a tan before mainly because I'm quite dark anyway, buuuut my legs are quite pale which is WEIRD! This does look like it gives that "I've just come back from a holiday" look. This is so pretty! I'm still looking for my Holy Grail tan! I might have to give this some consideration. That's such a difference! What a lovely tan!